Posted September 22, 2007 in 2007/09, Odds & Ends, Topic, z Archive. As a general rule comic book fans are very derisive about modern art. They feel that comic artists show greater talent then the fine artists of the last century. Much of modern art is not predicated on realistic depictions. Comic fans, and many of the general public, feel the lack of realistic illustration characteristic of most modern art shows that it is nothing more then a trick played by the artists. Thus a big hoax has been perpetrated on the museums and art collectors of the world and only those who have not studied art history can see that the emperor has no cloths. The irony is that not only have these comic book fans failed to appreciate the goals of fine artists, they also seem ignorant of what comic artists are actually doing. A realistic depiction is not the aim of comic artists either. Invariably these artists are concerned with telling a visual story and realism is often sacrificed toward that end. Probably no modern artist riles comic book fans more then Roy Lichtenstein. Lichtenstein became a famous Pop artist by transposing comic book art onto large painted canvases. There is a term fans use when one comic artist copies another, they call it swiping. It is not an accident that to swipe was originally a slang expression for to steal. For comic fans it was bad enough that Lichtenstein was swiping from comic artists, what was even worse was his paintings sold for thousands of dollars while the original comic book artist generally struggled to make a living. History adds insult to this story. Let me repeat part of a post I once did where I am talking about comic book artists Irv Novick (from Simon and Kirby Meet the Shield). 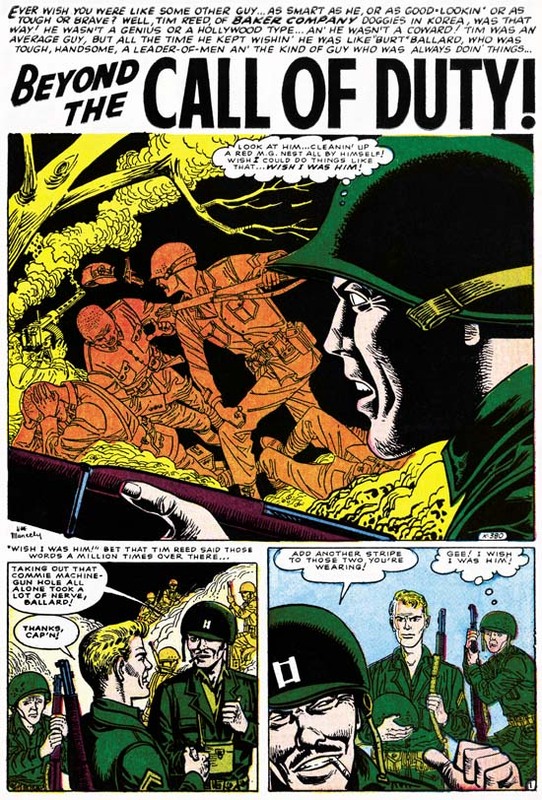 Although it is frequently cited that Irv did superhero work for MLJ until 1946, in fact, like many artists, Irv spent some time in the military. During that time Irv befriended Roy Lichtenstein, getting him out of manual work and helping Roy get a job that used his artistic talents. 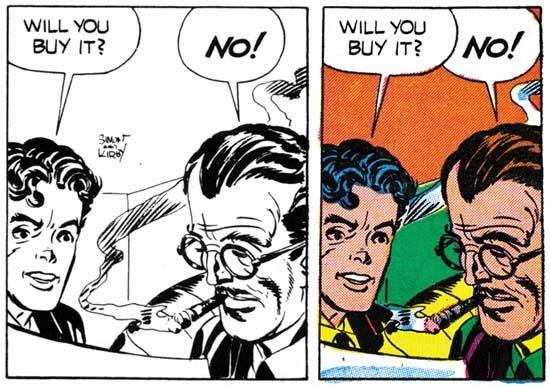 Of course no good deed goes unpunished, after the war Lichenstein became a highly paid pop artist by painting greatly enlarged copies of comic book art originally drawn by a variety of comic artists, including Irv Novick. Comic fans’ criticism of Lichtenstein has however missed the mark. Even realistic artists depict their subject matter through their own personal filter. No matter how realistic an artist tries to be or how technically talented he is, the final painting will not truly match the source. In truth it is not how realistic a piece of art is that determines how good it is, more important is how well the artist brings forth his personal vision. Roy Lichtenstein’s work is different only in his subject matter, instead of painting landscapes, portraits, or abstracts, at one time Lichtenstein painted comic book art. Lichtenstein’s paintings are not identical copies of comic book panels. 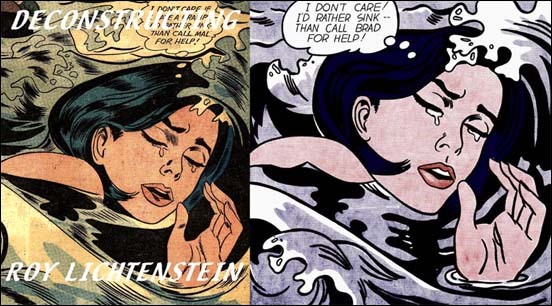 There is a marvelous web site call Deconstructing Roy Lichtenstein that provides examples of Roy’s paintings and the comic book source they were based on. Again and again they final painting deviates from the source. Some of it is editorial changes to improve the effect of the work. After all a painting stands by itself while the original source is just one panel in a sequence of panels telling a story. Coloring would also be adjusted by Lichtenstein. Even the famous Benday dots are actually Lichtenstein’s inventions and have nothing to do with the printing of the original comic book art. The line art was often adjusted by Roy. It would be nice to be able to say that Roy improved the line art, but in fact the final image often is inferior to the source. Lichtenstein could never had been successful as a real comic book artist. Although I disagree with the criticism leveled by comic book fans at Roy Lichtenstein that does not mean that I approve of his work. I am not bother by his copying comic book art but I do dislike his attitude towards his source. Lichtenstein’s paintings treat the comic book art as camp. The Pop art world could enjoy the impact of the original comic book art but since it was presented as a fine art painting they could view it with a amused sense of superiority. Fine art is supposed to provide more levels of meaning then that found in popular art. Frankly in the case of Roy Lichtenstein’s comic book paintings I just do not find enough deeper meaning to justify his condescending attitude toward comic book art. “Just what is it that makes today’s homes so different and appealing?” collage by Richard Hamilton made in 1956. My criticism of Roy Lichtenstein does not apply as well to all Pop art. 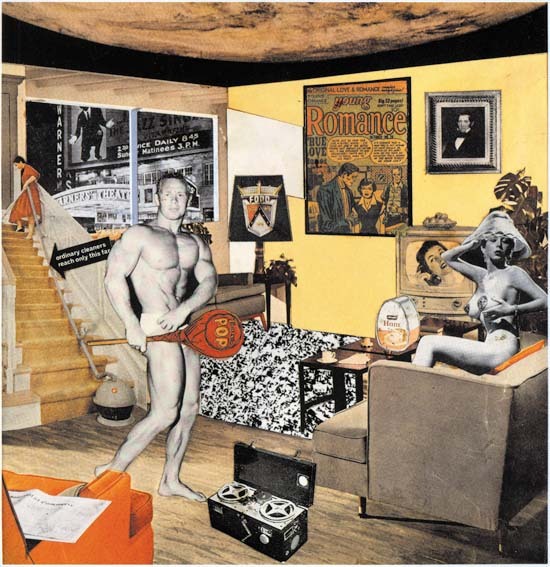 A case in point it the collage by Richard Hamilton, an image of which I provide above. Yes the presence of the Young Romance cover art in the collage does give this work of art special significance for me, more about that below. The comic book art plays only a small portion of the total effect of collage, the same can be said of all the individual pieces. Collages have a special magic, at least when done by an artist with talent. The components of the collage adopt two identities. The individual pieces become part of a bigger image while still remaining recognizable as being clipped from some printed source. The title of the piece (“Just what is it that makes today’s home so different and appealing?”) sounds like it belongs to an article in some home decor magazine. Which makes the image along with all its individual components all the more incongruous. Hamilton’s collage does have a sense of camp to it, but in this case I get the feeling I am a partner in the humor and not the blunt of it. Despite the fact that Hamilton seems to be pocking fun at American middle class society, he seems to have a genuine fondness for each piece of collage element that he uses. There is a reason that I am discussing Hamilton’s collage at this time. The latest issue of The Burlington Magazine has an article on it by John-Paul Stonard. In researching the piece John-Paul has managed to track down the source of most of the collage elements. Interestingly all the parts seem to come from American sources dating prior to 1956. It seems another British artist, John McHale who at the time was studying at Yale, sent a trunk full of material to Hamilton and that formed the basic source for the collage. Unfortunately one of the sources that has not been tracked down is the Tootsie Roll candy that plays such a prominent part of this art piece. The wrapper displays “POP”, a word coined in 1954 to describe the art movement. The Young Romance “painting” lead Stonard to the Jack Kirby Museum and Rand Hoppe, and Rand in turn lead John-Paul to me. The image provided of “Just what …” may give the impression of a large piece when it actually is about ten inches wide. What appears to be a Young Romance #26 cover clearly is too small to be the actual cover and had to be some sort of house ad. 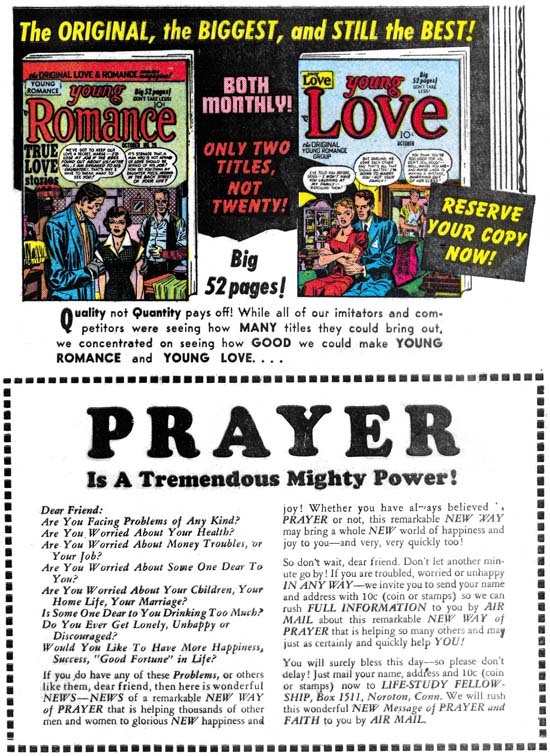 I did a careful search of all the Simon and Kirby productions from about when Young Romance #26 came out (October 1950) up to 1956 the year the collage was made. There were two different ads that the YR #26 was used in. There was a size difference between cover image used in the one variant (used in YL #13) and the second (use in YL #14, #15, YR #27). John-Paul said that the size of the second ad was the correct one. When I sent John-Paul a scan I thought that was as close we were going to be able to come in identifying the source. John-Paul however immediately noticed that the comic title in the scan I provided were in white characters while the one used in the collage were red. When I reviewed the ads again I found only one of the house ads had red letters in the YR #26 image. Thus we could be sure that the source of the collage YR image came from the house ad from Young Love #15. I like the fine arts, but my main interests in recent years has been the comics produced by Simon and Kirby. So I did not want this post only to have an image of the cover of Young Romance #26 as a faded piece in Hamilton’s collage, or even a better version found in the original house ad. Instead I wanted an image of the cover as close as I could make it to how it looked when it first appeared on the newsstands. I believed romance covers always posed a special problem for Jack Kirby in that he could not include action to make an interesting cover. To help compensate, Kirby turned to the use of visual props. I particularly like the way he has placed some in front of the characters. This gives the image a greater feeling of depth and prevents it looking like the people are standing in front of a stage setting. To do so though, Jack had to place some furniture and a shelf at what are really odd angles compared to the rest of the room. But as I have previously commented, comic covers are not meant to be realistic as if taken from a photograph. Usually it is time that is played around with in order to present what actually is a condensed story, here it is space. The only thing that bothers me about this cover is the wallpaper, I find the pattern too distracting. I admit that I get something out of Simon and Kirby productions, particularly the romance work, that was not part of their original intentions. It is not the sense of camp that Roy Lichtenstein and his admirers enjoy. Rather it is a reflection of the changing attitudes. I am sure the melodrama was probably a bit over the top even when it was published but I doubt it would even be considered a reasonable premise today. But then again today there are no more romance comics. I wonder about manga? Jack Kirby turned to freelancing when the Simon and Kirby studio failed. Battleground #14 (November 1956) was the first of his freelance jobs to be published. It also marked Kirby’s return to a company that he left almost 15 years before. Jack probably still remembered Goodman’s unfulfilled promise of royalties for Captain America, but Kirby had a family to support and so had to swallow his pride. His reentry job was a short five page war story called “Mine Field”. 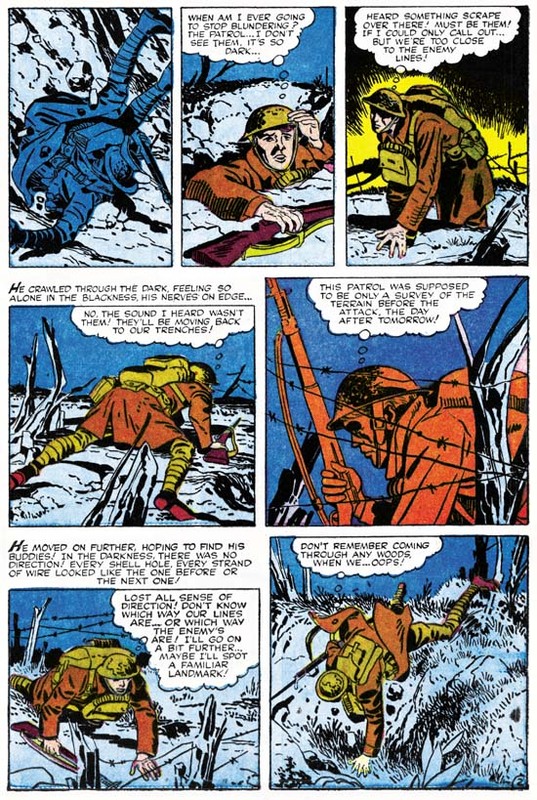 The job should have been easy for Jack, only a couple of years before Kirby drew, wrote and edited for Foxhole, a war comic for Simon and Kirby’s own publishing company called Mainline. One story for that title, “Hot Box”, was only two pages long and Jack still managed to make it a masterpiece. “Mine Field” is a simple tale. A somewhat bumbler of a soldier gets separated from his outfit during a night patrol. He becomes lost in the dark and by daybreak finds himself close to the enemy’s position. From his observations he realizes the Germans plans to lure the Americans into a mine field. Upon dark the soldier rearranges the German marker and finds the way back with the outfit. The table has turned and the enemy falls into their own trap. It is a good story, just not one that plays on what would normally be considered Kirby’s strengths. Jack likes his war action up close and personal and that is not what this story is about, although Jack does manage to sneak in some typical Kirby action in the last panel. But it is because the story does not have a lot of action that it provides a showcase for how good an artist Kirby was. I provide an example page above. Note that there really is not a lot happening on this page. We find the hapless soldier fall into a shell hole and his unsuccessful attempt to find his comrades. Yet by altering the view point and careful use of the landscape Jack manages to make it all interesting. Kirby is able to do this throughout the story. This sort of low action story may not have been the best vehicle for Jack, but he still managed to make it look easy. Jack’s pencils are always at their best when inked by his greatest inker, Kirby himself. For this story Jack’s inked in a manner which I referred to as the S&K Studio style. That style is categorized by bold brushwork and some unusual techniques. 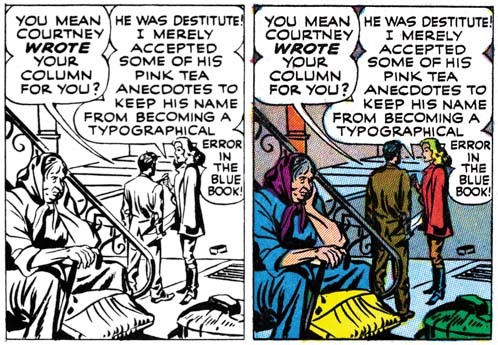 In the image I provide above, note the use of the picket fence pattern (see inking glossary) in the second and fifth panels. By itself there is nothing unusual about Jack’s inking in the Studio style, he had often used it in the past. What is surprising is that this style appeared in a work at this late date. At this time Jack had adopted a similar style but with a finer brush for Prize romance covers or a simpler style without techniques like the picket fence brushing for romance story art. However the inking in “Mine Field” does show one important trait agreeing with both the Fine Studio and Austere styles. Spotting has been downplayed giving the entire art a lighter look. Black areas tend to be limited coverage but when used are done by filling the area with ink. The inking for this story was not as masterful as Jack would shortly do for Atlas in Yellow Claw #2 and #3. However in its own understated way it is a beautiful job without any signs of rushing and loss of control found in “Afraid To Dream” that Kirby also did in the next month. I have already remarked above how the plot for “Mine Field” was not typical for Kirby. I also find that the actual text writing does not have Kirby’s “voice”. Jack’s writing usually includes exclamations that are a little over the top. I find none of that quality in the script for “Mine Field”. Therefore I do not believe that Jack had much to do with the writing for this story and that he was working from a script supplied by Atlas. This sets this story apart from most pre-Implosion Atlas work which either Kirby seemed to have a lot of control over the writing (Yellow Claw, “Afraid to Dream”, “No Man Can Outdraw Him” and “Pokerface”) or at least some input to the plot (Black Rider Rides Again). In my posts for this blog I generally avoid comparing other artists to Jack Kirby. It really is not fair and can result in overlooking the special talents these comic book artists possessed. Effectively Atlas made just such a comparison between Jack Kirby and Joe Maneely and judged Maneely as the better artist. Presumably this judgment was made by Stan Lee and it continued as long as Joe Maneely was alive. It was Joe that was the most frequent Atlas cover artist while Jack did not even get to do the covers for comic books titles where he did all the interior story art. In Battleground #14 Joe got the most important first story while Jack’s contribution was delegated towards the back. But this does not seem to reflect the actual merits of the two stories. Maneely is working from a script with much more action then what Kirby had. For a war title this should almost insure a more interesting story, yet Kirby’s piece is a much better read. Maneely just does not seem to know how to make the action exciting. Under Joe’s hands all of the artwork seems dry and unmoving. Even today there are those who say Joe Maneely was a great artist. I just do not understand exactly what they feel Maneely did so well. 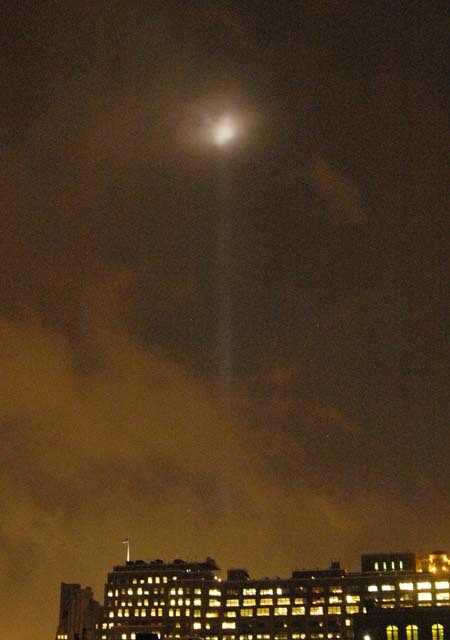 Posted September 12, 2007 in 2007/09, 9/11, z Archive. I purposely limit my posting on the Simon and Kirby blog to writings about comic book artists and their art. This just does not seem to be the place to discuss topics like my political views or personal opinions. I have made an exception to commemorate the lives lost in the terrorist attach on this day now six years ago. I trust my readers will forgive me this deviation from my normal writings. This year has brought some people calling for us to put this annual memorial behind us. They say that enough time has past to put an end to our collective mourning. One writer provide examples of other national calamities that we no longer pay an annual tribute to, such as the sinking of the Maine or Pearl Harbor. The irony for me was although I have no idea when the Maine sank, every December 7th I do think about the Japanese attack and the U.S. participation in the war that followed. I think this is because it had such a big impact on the lives of my parents, aunts and uncles. Nonetheless it is expected that the pain we feel will diminish with the passing of time and I have no problem with those who have already reached that point about the events of 9/11. However I do call for them to be tolerant of those of us who have not yet made that transition. For now though this day continues to brings a touch a sadness to me each year. I am not a vengeful person, but I suspect I would find it easier to put 9/11 behind me were it not for the fact that so many of the perpetrators of that crime are still at large with the full intent of inflicting further atrocities against us. 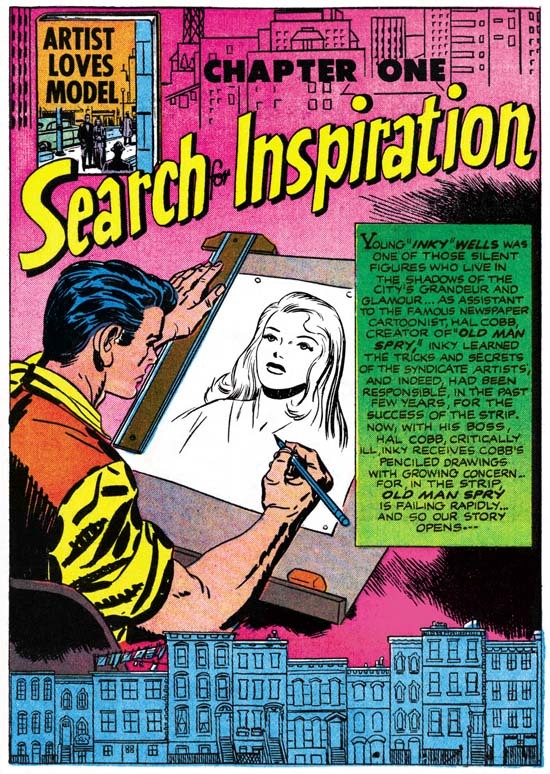 The artist and model theme was one that obviously resonated well with Simon and Kirby. 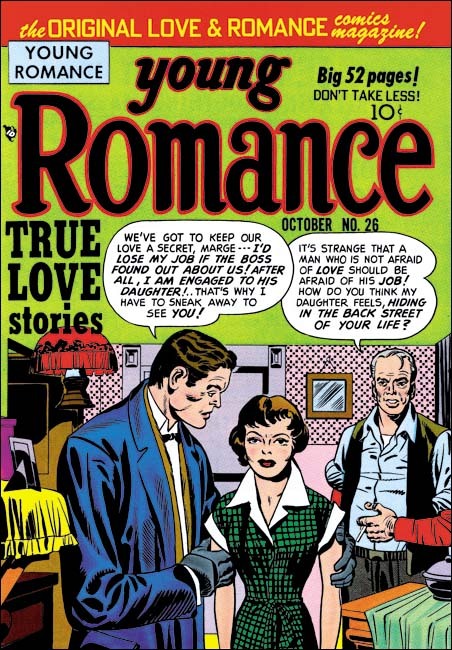 They launched the whole romance comic book genre using the theme on a cover The theme became the basis of a syndication strip proposal most likely from the late ’40s or early ’50s. Later Simon and Kirby then tried to use it as a basis for a new comic book title. Kirby and Bill Draut both made cover proposals for the “Artist And Models” book. 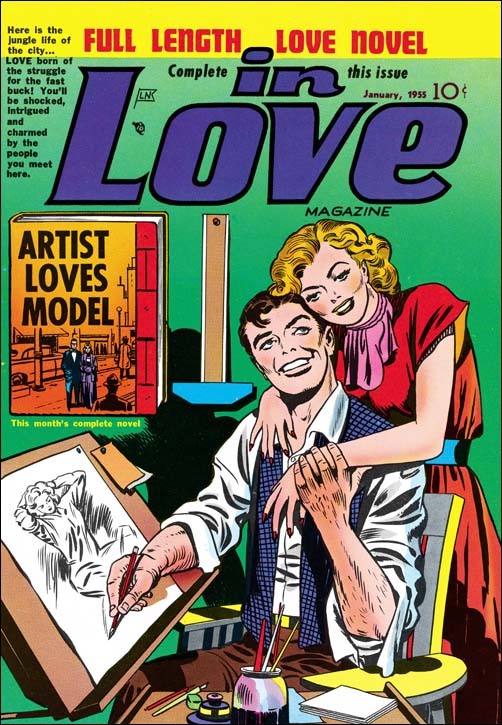 Kirby’s version of the cover and the original syndication proposals were used as a basis for the “Artist Loves Model” story for In Love #3. Theakston’s Jack Kirby Treasury vol 2 has one of the syndication strips. 2 panels made it into the comic version of the story, while 2 panels did not. The panels that made it were used in their entirety. Joe Simon’s collection has the original art for what was going to be the first page of the story. Two of the original three rows of panels remain on this page. Everything was cut and pasted, nothing was drawn on the board itself. Unlike the art from the Treasury strip example, this page did not use whole panels, instead these are pieces of panels cut to fit together. I am not sure why this page was abandoned, but it does seem to tell a story that deviates from the published version. We can be certain that the published first page was newly created for the comic book version of the story, a syndication strip would not require a full page splash. I am not certain, but I believe Simon did the inking. It is even blunter then what Kirby was doing at the time without the type of control Jack usually provided. When I showed Joe this page he commented that he felt there was too many words in the caption. It is an unusually wordy introduction for a Simon and Kirby comic. This was probably due to the need to cover the part of the story which had been on the abandoned first page that I talked about above. Although I have attributed the pencils to Jack, he may not have done the rows of buildings at the top and bottom of the page. In any case the tenements on the bottom are a particularly nice touch. 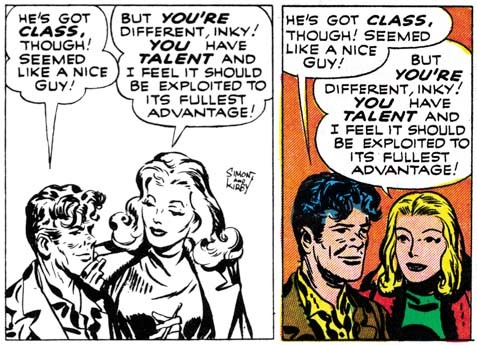 Of all the stories published for the In Love title, or any other Simon and Kirby romance productions, the inclusion of “Artists Loves Model” in the romance genre is the greatest stretch. Although love plays and important part of the story it really is not the central theme. The real theme for this story concerns artistic creativity. The story follows the lead character Inky from the end of his gig as an assistant to a famous and successful syndication strip artist. We see Inky’s failed attempt at creating his own strip. Eventually our hero does accomplish his goal, but only as an unwitting accomplice to intellectual property theft. When Inky realizes what has happen he abandons his new found success and sets things right. But he has not only proved his moral integrity, but his artistic value as well. Inky ends up with a new assignment and there is little doubt that he will be very successful with it. BECAUSE YOUR CHARACTERS ARE ARTIFICIAL, INKY … THEY LACK LIFE! 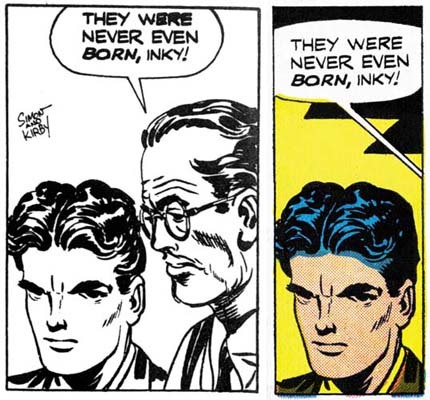 NO EDITOR IN HIS RIGHT MIND WILL ACCEPT THAT LIFELESS CREATION, INKY! IT’S JUST A GOOD-LOOKING CORPSE! A MAN DOESN’T SEARCH FOR AN INSPIRATION … IT EXPLODES IN HIS MIND! The way this particular comment is phrased sounds so like Kirby to me. It is just the sort of thing that Jack might have said thirty years later. This is the way the love blind Inky sees Miss Dreame. Donna is so taken by Inky’s idolized version of herself that she resolves to be more like the woman that the artist has portrayed. Real life has inspired art which in turn becomes a source of inspiration. I believe this is a rare presentation of a core, if unspoken, Simon and Kirby philosophy. 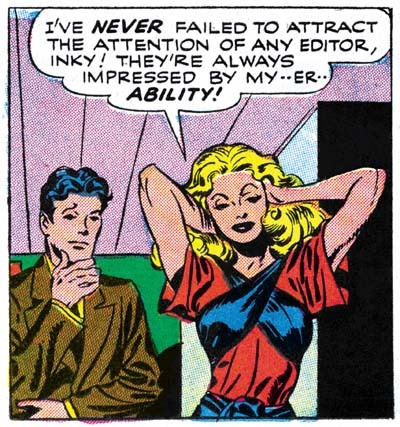 I can think of no more capable comic book creators at that time then Simon and Kirby. Yet Joe and Jack never went to the extremes found in comics produced by companies like EC. Even before the Comic Code there was a self imposed barrier of good taste that Simon and Kirby would never extend beyond. As businessmen money was very important to them, but never to the point that Joe and Jack would compromise their product. Simon and Kirby wanted their stories to be sources of inspiration for their readers and not just a vehicle for cheap thrills. 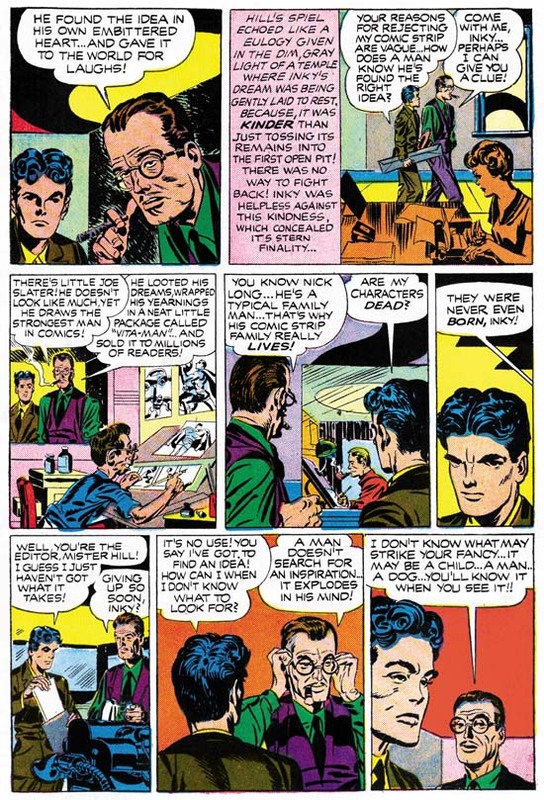 “Artist Loves Model” is unique among the numerous Simon and Kirby productions. Unfortunately In Love #3 is probably the rarest of all the Mainline/Charlton Simon and Kirby issues. Further this story has never been reprinted. The story has no superheroes or blazing guns yet I think it is a most important story that every Simon and Kirby fan should read. Perhaps someday that will once again be possible. The format of the In Love would change after issue #3. Never again would the title include a “book length love novel”. Nor would the stories have the unique flavor that previously even many of the backup stories had. 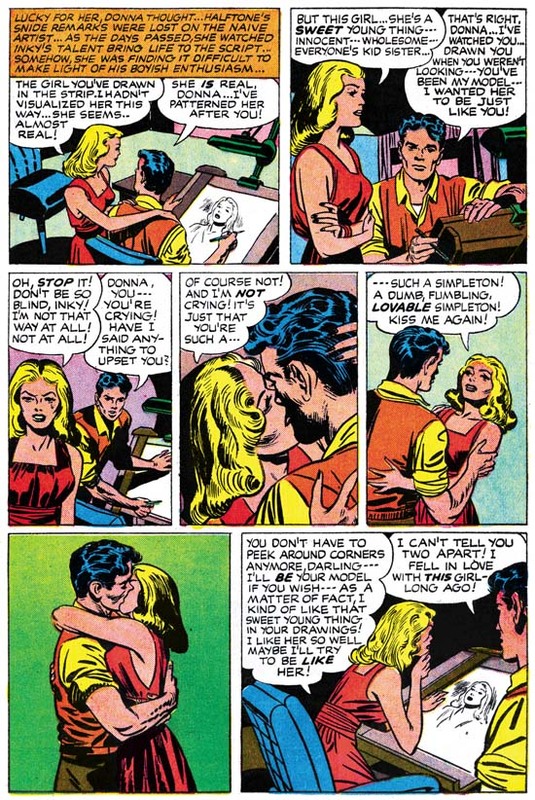 The stories from In Love became indistinguishable from those concurrently being produced by Simon and Kirby for Young Romance, Young Love and Young Brides. I will continue scanning and restoring the remaining issues of In Love but I doubt I will be posting about them at this time. First I need to write about Simon and Kirby’s long and fruitful career in the romance genre. When I wrote the above I had completely forgotten that Bob on the Jack Kirby Comics Weblog had once posted on the syndicate version of this story. I am in the process of getting a copy of Buried Treasure v1 #2 which Bob reports has 36 strips. When I do I will post on what portion of the original strip made it into the comic book story. There is a gap of a couple of months between when Simon and Kirby left Timely and their first published work for their new gig, DC. In his book, The Comic Book Makers, Joe has said that they did some ghosting at first. I am surprised about that because later attempts by Joe or Jack to copy another artist’s style were not very successful. I would think that by now someone would have identified any ghosting that they did for DC. 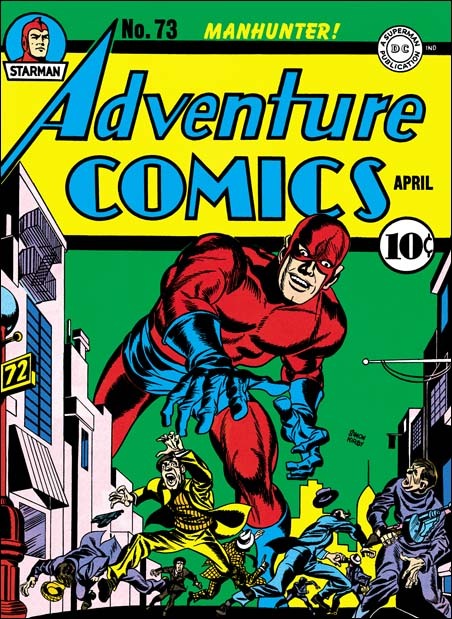 The first known work for DC was a Sandman story in Adventure #72 (March 1942). Simon and Kirby imparted to Sandman their unique storytelling talents. 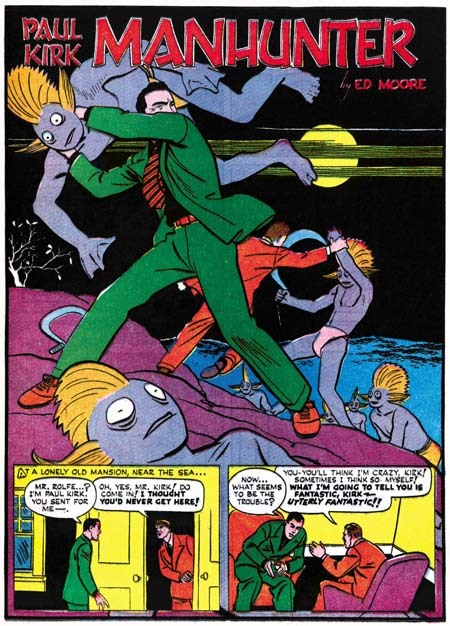 However Sandman was not their own creation, Simon and Kirby did not even create a new costume for the hero. For the next Adventure issue S&K added another feature, Manhunter. This replaced the series Paul Kirk Manhunter. Joe and Jack kept the concept of a big game hunter using his skills to combat crime. Instead of fighting crime as a detective, Simon and Kirby would give their hero a costume and a secret identity. It seems that Joe and Jack wanted to distance themselves further from the previous strip by calling the hero by a new name, Rick Nelson. Probably at the instigation of DC management, Manhunter’s alter ego changed back to Paul Kirk in the next issue’s story and so would remain. The name of Manhunter’s secret identity was not the only thing that changed after the first story, there was a costume change as well. 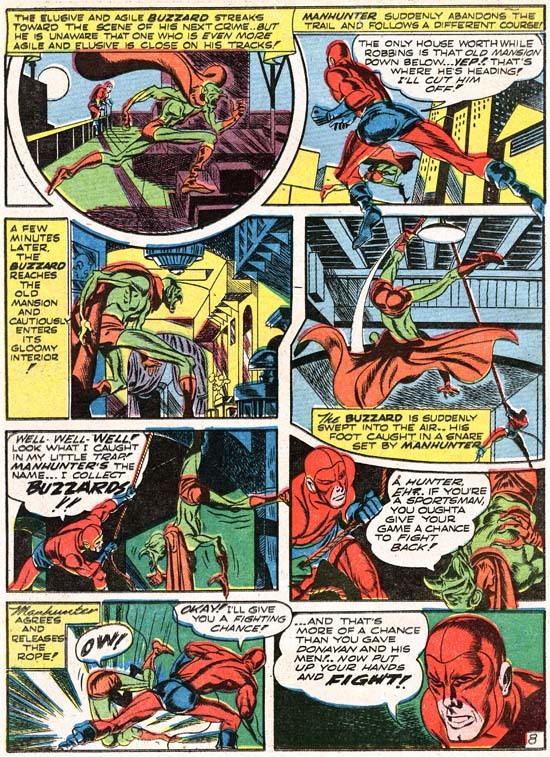 Initially Manhunter had a mask which left bare his lower face, very much in the style that Simon and Kirby had used previously for Captain America. This would be replaced afterwards with a blue mask that covers the entire face. It is only the face that is blue, the rest of the head is red like most of the costume. This blue mask is unlike anything that Simon or Kirby did before, and they would never repeat it. There is a separation between the blue mask from the rest of the head gear. The demarcation between the two follows a path about where the hair line would be and then traces down the cheeks. A careful examination reveals that the new costume did not actually start with the second issue, but was used in the first story as well. It is only the coloring used that makes the first story look like it matches the cover art. Chances are when DC noticed the discrepancy between the cover art and the story they asked Simon and Kirby to correct it. 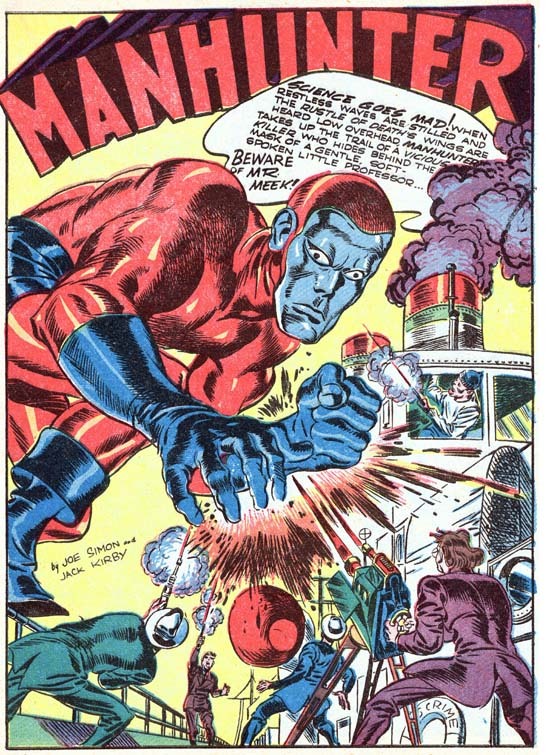 On the splash page Manhunter was modified by the addition of a upper face mask. Such a modification probably took too long, and the results were neither matched the cover nor were very satisfactory in its own right. So the rest of the story was altered by the judicious use of color alone. Aside from the issues of the costume and secret identity, everything for Manhunter was in place right from the start. In Captain America the origin story seemed like something that S&K had to get over with as quickly as possible so that the real tales could be presented. With Manhunter Simon and Kirby handled the origin better, integrating it into the first story quite well. Kirby continued drawing with devices he had adopted in Captain America, variable shaped panels, figures that extended beyond panel boarders, exaggerated perspectives, outrageous running strides, and what would become a Kirby trademark, his socko punches. Jack’s pencils seem better, as if he was now fully in control of what he was doing. But of course Kirby’s art always seem to change and improve as he was never satisfied to rest on his former achievements. For me it was with the early DC work and the Harvey covers that the Simon and Kirby unique artistic vision first congealed. An important part of this was their forging a unique inking style. You can see suggestions of it in Captain America, but perhaps because of all the different hands used to produce that comic it all appeared a bit piece meal. With the DC and Harvey work the brushwork would be bold yet sensitive. It is not just the art that makes Simon and Kirby productions so great, it is the writing as well. Simon and Kirby managed to leave their unique touch on the Manhunter stories. There was nothing else at the time as exciting as Manhunter in Adventure Comics, or for that matter any of the DC comics, well except of course for the Sandman stories. Manhunter was matched against crime lords, evil scientists, jewel thieves, Nazi spies and escaped convicts. No matter what foe Manhunter pitted himself against he would manage to track them down, although sometimes he would end up being hunted in return. They were all fast pace adventures and in my opinion great reads. There was one aspect about Manhunter that Joe and Jack seemed a little uncomfortable with. Simon and Kirby preferred to give their heroes a sidekick, so that they would have someone to talk to as Joe would explain. Simon and Kirby’s solution to this problem in Manhunter was to provide a different sidekick as the need aroused. In “Scavenger Hunt” (Adventure #73) Manhunter teams up with a young man trying to prove his worth to his would be love. For “Beware of Mr. Meek” (Adventure #75) the sidekick is of all things a beautiful jewel thief. A boy scout helps the temporarily blinded Manhunter follow the crooks’ trail in “The Legend of the Silent Bear” (Adventure #76). In “The Stone of Vengeance” (Adventure #77) a shoe shine boy becomes involved in Manhunter’s case against some murderous jewel thieves. The lady in “The Lady and the Tiger” is effectively Manhunters sidekick in Adventure #78. Finally in “Man Trap Island” (Adventure #80) he teams up with a young Indian lad to combat escape convicts. Only in the origin story and “Cobras of the Deep” (Adventure #79) does Manhunter truly work alone. Simon and Kirby only did eight Manhunter stories. The feature did continue but under much less talented hands. Unfortunately Manhunter was not the sort of character that could continue to be successful without the Simon and Kirby touch. Frankly I am surprised it made it as far as Adventure #92 (June 1944). Reprints of most of the S&K Manhunter stories appeared as backup features for some of Kirby’s DC comics in the early ’70s. Jack would also do a retro version of the Manhunter in 1975 (1st Issue Special #5). These ’70s work must have had an impact because over the years DC would publish a variety of Manhunter avatars, the latest being a female version. With Manhunter’s continued significance in DC continuity I would have thought that a tradeback edition of the original Simon and Kirby stories would be a no brainer. Yet despite all the archive editions published, DC seems reluctant to reprint Manhunter or any of the other Simon and Kirby creations. I wonder why?